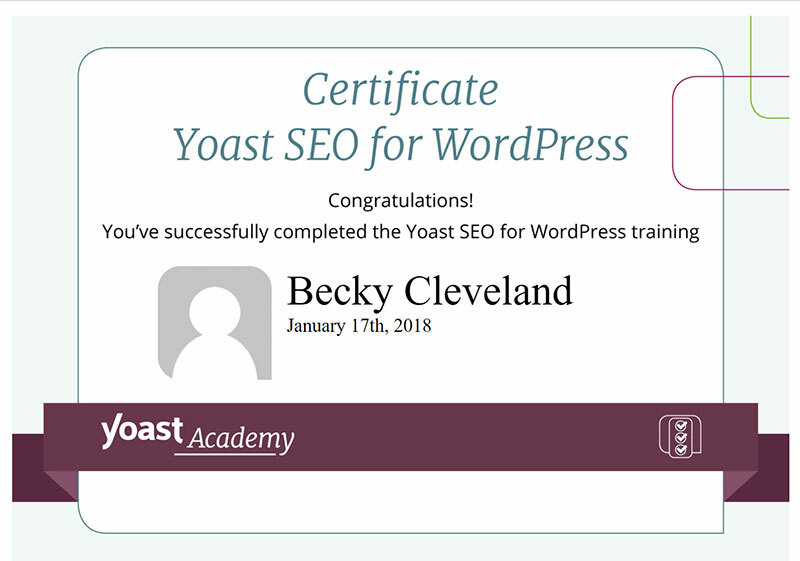 I am excited to announce that I have completed the Yoast SEO Training Course and can proudly display my Yoast SEO Certification. It required tuition plus 20 hours to complete training. That included 180 minutes of video and passing 43 quizzes. With over 82 million downloads and 5 million active downloads of this plugin, I am one of 1,844 people (as of January 18, 2018) to have successfully completed the course! Now I am one of the elite that has access to the hidden seo plugin features! What a great opportunity to learn from the best in the SEO plugin industry. We all know SEO (search engine optimization) is what we all strive for. We want to rank in the search engines beating our competition. While that is not easy to come by it does help to have the right plugin and training on how to maximize the tools. There are many factors involved in SEO which change daily making it impossible for any one person to ‘know it all’. I find YOAST at the top and a great companion for WordPress websites. PreviousPrevious post:Tri-State Commercial RoofingNextNext post:Anyone Can Build A Website…Right?